Oxney Farm is situated immediately north of the "new" Martinique Barracks (now demolished) and, was the training ground for many cadet units where they camped under canvas. On occasion a visiting general would inspect them. 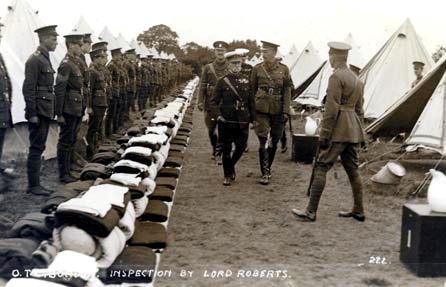 In August 1912 Lord Roberts, or 'Bobs Bahadur' as he was affectionately known, inspected the Officers' Training Corps. Many civilians came to witness the occasion, which was his last visit to Bordon, as two years later he died of pneumonia at the Front in France. Oxney Farm was between the wars the home of the Bordon Drag Hounds, which was run by the officers of the artillery regiments stationed in Louisburg Barracks and was the successor of a drag hunt maintained at Longmoor by the Mounted Infantry School. The Bordon Drag met on Mondays and Fridays to hunt the fox and on Thursdays to follow the drag. The hunt was not revived after the 1939-45 War, the last Master before the War being Lt J C D Ellison RA, with Gunner Legge as kennel huntsman. The Aldershot Beagles occupied Oxney Farm Kennels since 1948, when they moved from Iveley Farm, Aldershot, a move necessitated by the extension of the runway at the Royal Aircraft Establishment, Farnborough. They were a military pack and had been in existence since 1870, first in Aldershot, where they were kennelled near the Dust Holes (military slang for the Cemetery) until 1895 when they moved to Iveley Farm. One of the outstanding characters of the Aldershot Beagles in their early days was Eli Cranston, who joined the pack in May 1888 and faithfully served them until he retired in 1937. He died 23 years later, aged 93. In 1970, to mark the centenary of the founding of the pack, a presentation was made to Brigadier F M S Gibson who had been Joint Master since 1950. The gift was a painting of the hounds hunting near Holybourne painted by Brigadier J B Oldfield, then Chief of Staff, South East District and Chairman of the Hunt. In August 1914 many troops and their relatives arrived in Bordon in their hundreds. The troops were confined to barracks and then the 1 st Gloucestershire Regiment and the 1 st South Wales Borderers were given four hours to prepare to leave as part of the British Expeditionary Force to France. Almost in silence half of them marched to the station in the middle of the night, only the wives and children gave them a final farewell wave as they passed the married quarters. On arrival at the station, the train was waiting in the sidings, the baggage and horses were quickly entrained and they left for Southampton. On 3 rd October there was a royal review at Oxney Farm Camping Ground. The King, Queen, Princess Mary and Lord Kitchener visited the camp to see the young men from offices, fields and factories, who were the recruits for Kitchener's Army. There were 17,000 men in Bordon and 15,000 of them were present for the inspection. They were part of the 3 rd Army, were in civilian attire and hardly any carried weapons. The King and his military suite were dressed in the khaki of the battlefield. By the 10 th October there were 20,000 troops in camp and the first German prisoners arrived at Bordon. While they were waiting for their train to Longmoor, a troop train filled with about 500 Artillery of Kitchener's Army, arrived at the other platform. When it became known that there were German prisoners there, the more adventurous rushed to see them. Hardly had they been there a few minutes before a corporal, with about six days seniority, came along and in a loud voice ordered them to return to their train. By New Year 1915, Scotsmen formed the vast majority of the Garrison in Bordon. New Year's Day was a holiday ushered in by pipes and drums played around the barracks. They celebrated all day but the bad weather kept them indoors. The officers of the King's Own Scottish Borderers entertained the Earl of Selborne KG and Brigadier General Wilkinson GOC with songs and music including Auld Lang Syne and the National Anthem.